PanARMENIAN.Net - A Buk missile system was displayed during rehearsals ahead of Armenia’s Independence Day parade on Friday, September 16 at the Republic Square in Yerevan. Preparations for the parade are currently underway, with large amounts of military equipment already transported to Yerevan. Also, Armenia will showcase Smerch multiple rocket launchers during the parade. 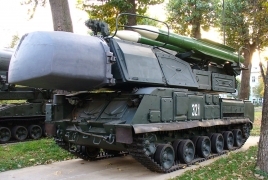 The Smerch systems include 9A52-2 and 9A52-2 launch vehicles, 9Տ234 or 9Տ234-2 transloaders, 300mm rockets and other fire control equipment, as well as a 1B44 Meteorological Complex.